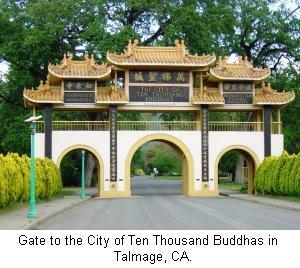 Two miles east of Ukiah, which is the county seat of Mendocino, in Talmage, is The City of Ten Thousand Buddhas. This is an international Buddhist community and monastery founded by Hsuan Hua, an important figure in western Buddhism. This is one of the first Chinese Zin Buddhist temples in the United States, and one of the largest Buddhist communities in the Western Hemisphere. The founder of The City of Ten Thousand Buddhas, Hsuan Hua was born on April 16, 1918 at Jilin Province, China. His parents were devout Buddhists, and Hsuan Hua at an early age, became a vegetarian like his mother, and decided to become a buddhist monk. At the age of 15, he took refuge in the Triple Gem under the Venerable Chang Zhi. That same year he began to attend school and studied texts of various Chinese schools of thought, and the fields of medicine, divination, astrology, and physiology. At 19 years of age, Hua became a monastic, under the Dharma name An Tzu. In 1959, Hsuan Hua sought to bring Chinese Buddhism to the west. 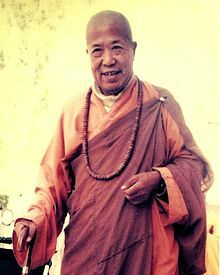 He instructed his disciples in America to establish a Buddhist association, initially known as The Buddhist Lecture Hall, which was renamed the Sino-American Buddhist Association before taking its present name: The Dharma Realm Buddhist Association. Hsuan Hua founded The Dharma Realm Buddhist Association (DRBA) which is a Buddhist organization with chapters in North America, Australia and Asia. Hsuan Hua traveled to Australia in 1961 and taught there for one year, returning to Hong Kong in 1962. That same year, at the invitation of American Buddhists, he traveled to the United States, his intent was to “come to America to create Patriarchs, to create Buddhas, to create Bodhisattvas”. Hsuan Hua resided in San Francisco, where he built a lecture hall. Hsuan Hua began to attract young Americans who were interested in meditation. He conducted daily meditation sessions and frequent Sutra lectures. The Dharma Realm Buddhist Association purchased the City of Ten Thousand Buddhas site in 1974 and established an international center there by 1976. The City of Ten Thousands Buddhas in Ukiah, California is one of the first Chan Buddhist monasteries in America. Because of the increasing numbers of people who wished to become monks and nuns under Hsuan Hua’s guidance, in 1972 he decided to hold ordination ceremonies at Gold Mountain Dhyana Monastery. Two monks and one nun received ordination. Subsequent ordination platforms have been held at the City Of Ten Thousand Buddhas in 1976, 1979, 1982, 1989, 1991 and 1992, and progressively large numbers of people have received full ordination. Over two hundred people from countries all over the world were ordained under him. On June 7, 1995, Hsuan Hua died in Los Angeles at Cedars-Sinai Medical Center. His sudden passing came as a shock to most of his disciples. His funeral went from June 8 to July 29. On June 17, Hsuan Hua’s body was taken from Southern to Northern California, returning to the City of Ten Thousand Buddhas. All major services during the funeral were presided over by Venerable Ming Yang, abbot of Longhua Temple in Shanghai and a longtime friend of Hsuan Hua’s. On July 28, monks from both Theravada and Mahayana traditions hosted a memorial ceremony and cremation. The two thousand and some followers from the United States and Canada, and various Asian and European countries, including many of Hsuan Hua’s American disciples, came to CTTB to take part in the funeral service. Letters of condolences from Buddhist monks and dignitaries, including from President Bush, were read during the memorial service. A day after the cremation, July 29, Hsuan Hua’s remains were scattered in the air above the City of Ten Thousand Buddhas by two disciples, Reverends Heng Sure and Heng Chau, one of Master Hua’s first disciples, in a hot air balloon. After the funeral, memorial services commemorating Hsuan Hua’s life were held in various parts of the world, such as Taiwan, China, and Canada. His sarira (relics) were distributed to many of his temples, disciples and followers. Born from the pure vision of a great sage, conceived with great compassion, realized wit intense vigor, and dedicated to the spiritual upliftment of all beings, the City of Ten Thousand Buddhas became a reality in 1976. Situated at the foot of Wonderful Enlightenment Mountain, the song of the Dharma and the light of the truth shines throughout this 488 acre valley. 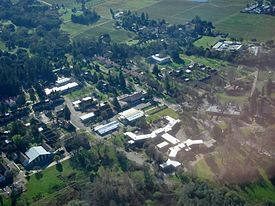 The City of Ten Thousand Buddhas originally was the site that housed the Mendocino State Hospital founded in 1889. There were over seventy large buildings, over two thousand rooms of various sizes, three gymnasiums, a fire station, a swimming pool, a refuse incinerator, fire hydrants, and various other facilities. A paved road wound its way through the complex, lined with tall street lamps and trees over a hundred years old. The connections for electricity and pipes for water, heating, and air conditioning were all underground. Both the architectural design and the materials used for the buildings were state of the art. The heating and air conditioning were centrally controlled. Hua visited the valley three times and negotiated with the seller many times. He wanted to establish a center for propagating the Buddhadharma throughout the world and for introducing the Buddhist teachings, which originated in the East, to the Western world. Hua planned to create a major center for world Buddhism, and an international orthodox monastery for the purpose of elevating moral standards and raising people’s awareness. The city comprises 488 acres of land, of which 80 acres are developed. The rest of the land includes meadows, orchards, and forests. Large institutional buildings and smaller residential houses are scattered over the west side of the campus. The main Buddha Hall, monastic facilities, educational institutes, administrative offices, the main kitchen and dining hall, Jyun Kang Vegetarian Restaurant, and supporting structures are all located in this complex. The Jewell, Hall of Ten Thousand Buddhas: This beautiful building was finished in 1982, and is adorned with streamers, banners, lamps and a 20 foot statue of a thousand-handed Avalokitesvara Bodhisattva, popularly known as Guan Yin Pusa in Chinese. Rows of yellow bowing cushions are lined upon the red carpet. The walls are adorned with 10,000 images of the Buddha, molded by Hua. Tathagata Monastery: These are the dorm rooms for monks and male lay persons persuaded toward the monastic lifestyle. Five Contemplations Dining Hall: Also completed in 1982, it is where the monastics and resident lay community follow the formal monastic style in taking their lunch meal. Only pure vegetarian food is served there, and the hall can seat over 3, 000 people. Dharma Realm Buddhist University: This university emphasizes the activation and development of one’s inherent wisdom and compassion. Founded in 1976 this university raises the level of education among Sangha members and trains people to propagate Buddhism. The university aims to educate students to become wise and virtuous leaders in the world. Instead of merely transmitting academic knowledge, it emphasizes foundation in virtue, which expands into the study of how to help all living beings discover their inherent nature. Jyan Kang Vegetarian Restaurant: Serves only vegan food, with the goal to serve healthful nutritious food full of the good karma on non-harming. Food is prepared with heart that cherishes life, nourishes the body, the mind, and the spirit. 10 Acre Organic Farm: This farm is a CCOF certified organic farm, whose produce supplements the meals in the dining hall. Wonderful Words Hall: This site is for daily gatherings to listen to Hua’s taped lectures in the 10,000 Buddhas Hall. In addition there is a Library, Book & Gift Shop, Wisdom Hall, Cottages and also the Great Compassion Courtyard and Bell and Drum House. The wildlife at The City of Ten Thousand Buddhas has many animals that roam the grounds of the city, including peacocks, deer, squirrels, and numerous other species. During special Dharma Assemblies, a Liberating of Life Ceremony is held where many animals, especially pheasants and chukars brought from hunting preserves are set free. Traditions held at the Monastery are two distinguishing features of the City of Ten Thousand Buddhas are that unlike many other Chinese Buddhist monasteries, the monastics always wear their kasaya sashes (long sashes that are worn outside the monastic clothing), and they eat only one meal a day and only before noon. At night most of them sit up and rest, not lying down to sleep. Monastics at the city do not have any social lives, nor do men and women intermingle. Whereas many ordinary Chinese monks go out to perform rituals for events such as weddings or funerals, none of these monks do so. Some monastics even choose to maintain a vow of silence, for varying periods of time. They wear a tag saying “No Talking” and do not speak with anyone. There are monks and nuns who maintain the precept of not owning personal wealth and not touching money, thus eliminating the thought of money and increasing their purity of mind. Largest Temple in the Western Hemisphere: It is unclear which is the largest temple. The temple known as Hsi Lai Temple, located in Hacienda Heights, a city in Southern California has claimed since 1988 that they are the largest temple in the western hemisphere. However, The City Of Ten Thousand Buddhas has over 80 acres of built up land on 488 acres of property compared to the Hsi Lai Temples which occupies 15 acres, but rather than a temple as is Hsi Lai Temple, The City of Ten Thousand Buddhas is more of an entire community with several large buildings clustered together. Therefore, it is unclear which is the larges, as there is a significant difference between the structure location of the two buddhist organizations. This entry was posted in Mendocino Interest and tagged buddhas, buddhists, city of ten thousand buddhas, disciples, hsuan hua, largest temple, Mendocino, monasteries, monastery, monks, organic farm, temple, ukiah, western hemisphere.